Recently Kulm Public School and the Kulm City Park Board together authored a memorandum of understanding regarding the shared use and maintenance of the City Park space. The signed document will finalize a beneficial collaboration on public recreational property that began in 2015. At that time the Kulm Public School playground was moved to the city park during construction of the new school; however, the outdoor basketball court could not be moved. Instead the concrete was broken up and the hoops were laid next to the bus barn until concrete could be laid for a new court. The school immediately began hosting fundraisers for a new court and received donations from local businesses as well as a gift from the class of 2006. Area residents Kim and Cory Schlecht received $2,500 from Monsanto to direct towards a community project, and they also chose to give to the court. Students have waited years to get their court back, and beginning in August, it will be available for use! The court will be located just north of the bus barn, have four basketball hoops and a walking path to the courts, making it ADA accessible. To reduce costs, the school board has chosen to reuse fencing from the old basketball/tennis courts, which will be moved to the new site in the near future. To make room for the new court, 5 trees will have to be removed, some of which are old or diseased. 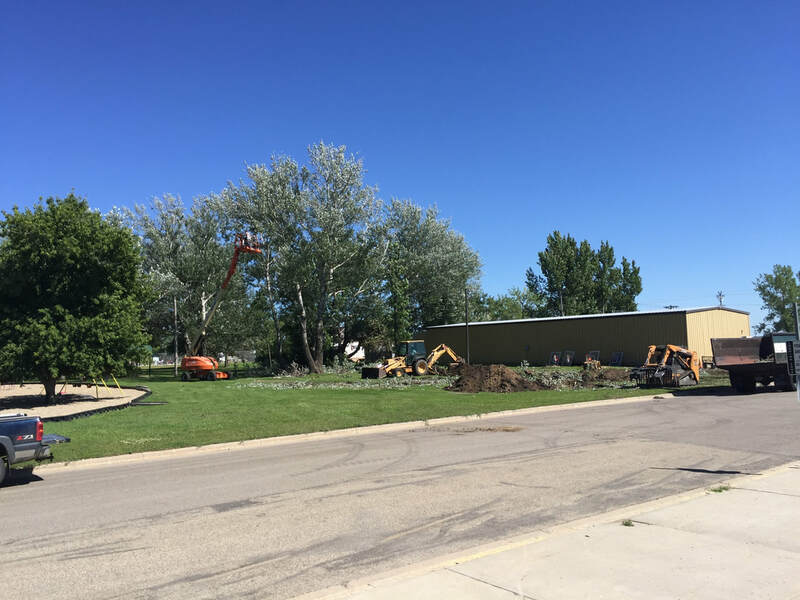 Taking down a tree is always a difficult decision; however, Park Board Vice President, Rodney Kinzler said that the Park Board has had to regularly remove large branches from these trees for safety reasons. Because of their age or condition, they drop branches often and can be dangerous to park goers. The Park Board is assessing the rest of the park to find suitable places to plant replacement trees. The new court will be 46x75 feet, allowing it to support a variety of activities. The school also hopes to add custom VersaCourt tiles in the future. VersaCourt tiles are laid on top of concrete to provide additional protection to the court and users. The tiles are customizable, meaning the school could add lines for multiple sports such as four-square, pickleball, tennis, basketball, and more. The cost estimate of the tiles is approximately $15,000, but the end result is a court that is more usable, versatile, and longer-lasting. Fundraising for the tiles has already begun. Coteau Hills Farmers’ Market and the Kulm City Park are together hosting Picklepalooza—a festival for all things pickled!—on September 29. Picklepalooza will include a pickleball tournament, pickle judging, and many other elements, with all proceeds going towards the court tiles. In addition, donations are welcome at any time through the Kulm Public School Foundation. Gifts to the foundation are tax deductible and will be recognized at the court site. Community partnerships are part of what makes Kulm the thriving small town that it is. The outdoor sports court project is another example of a valuable collaboration by the park board and school to provide better resources for all of Kulm. Volunteers and City Park Board members prepare the site of the future outdoor sports court. Four basketball hoops sit outside the bus barn waiting to be put up in the next few weeks.